Take USFS-191 north from M-28 about 1 mile west of the Baraga/Houghton County line and go about 2 miles to a fork. 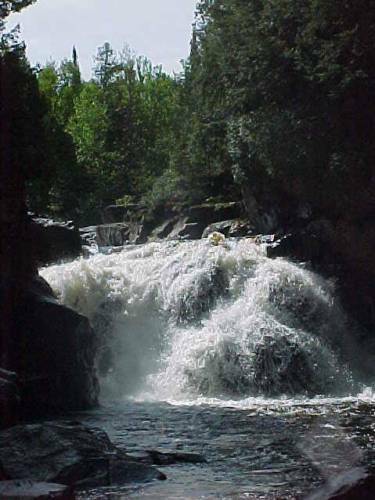 Go on the right fork, continuing on USFS-191 for about 3.6 miles to the Sturgeon River. (Follow signs to Sturgeon River Campground from M-28.) Cross the river (the Sturgeon River Campground will be on the left) and continue on USFS-191 for about 6 more miles to USFS-193, just past where USFS-191 turns sharply to the right. Turn left (northwest) onto USFS-193 and go one mile to a trailroad on the left that leads to the falls. Turn left (south) on the trailroad and go about one-half mile to the parking area. From the parking area there is an old 4-wheel-drive trail that leads doen with hill toward the river. Follow that trail to the bottom of the hill, and then go upstream about one-half mile to the falls. 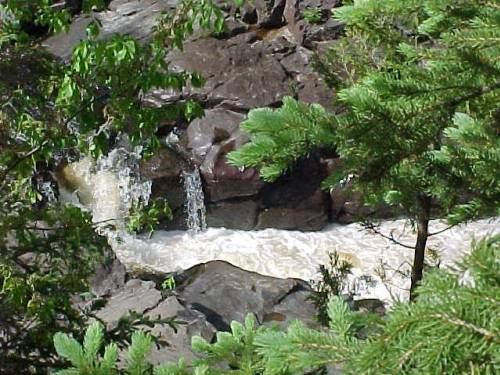 The trail follows high above the river for a while, and then leaves the river before going back toward the river just above the main falls. I was at Sturgeon Falls on 11 October 1992 and on 31 May 2000. Page last updated 27 Jul 2006.